I'm flying back home today after my short break away, so sadly today is the last of my guest bloggers. Today, please welcome Rebecca from Polished Peripherals. Hi More Nail Polish fans, my name is Rebecca from Polished Peripherals and I'll be your host for today :) So what do you do when one of your blogging idols invites you to do a guest post? Well if you're me you panic, doubt your worthiness, spend a fair bit of time trying to come up with something good enough, bury your head in the sand and leave it 'till the last minute, and then panic again of course. Seriously how could I come up with something worth showing on Cathy's blog. She has beautiful nails, great photos, amazing nail art and is a wealth of knowledge. I first discovered her blog when I was researching things like spectraflair to make my own polishes and I've since learned a lot, and spent a lot, thanks to Cathy's posts. So I thought maybe I could try to recreate some of Cathy's nail art, umm nope I'm not that good yet. I even went back to the first nail art she shared, thankfully it wasn't stamping but still I don't think I could do it justice. So then, how about I swatch one of my polishes that I can thank Cathy for, something her reviews made me run out and buy, or one of the Layla's I got from her group buys? I think I actually have some Layla's Cathy hasn't shown yet. Then I decided a straight forward polish swatch wouldn't be enough, so how about a clever colour changing polish? 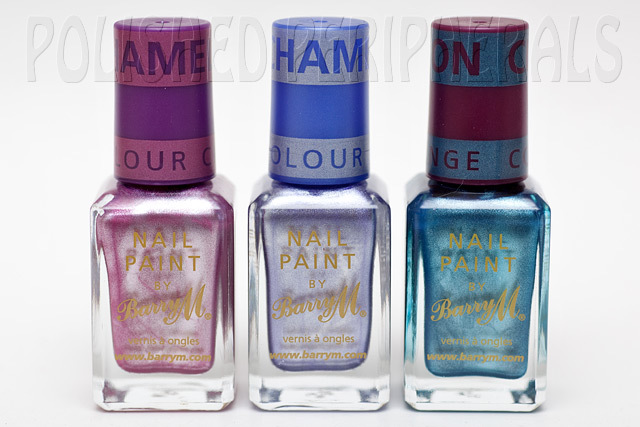 I have three Barry M Chameleon polishes. These are the polishes that change colour when a clear top coat is applied. I bought these back in July and I've since seen a few other brands bring these out but this is the only brand I've tried. Chameleon Pink, Chameleon Lilac and Chameleon Blue. The bottle caps show the original and 'change' colour. Today's polish is the silver/purple one, Chameleon Lilac. It's a very light purple tinted silver. It's quite a nice silver and best of all it's a single coat polish. Completely opaque in one smooth coat, got to love that! Unfortunately it does nothing to hide nail ridges and can be a bit prone to show brush strokes. Visible brush strokes and ridges :( I have twisted ridges on my pinkie nail. With a topcoat the colour changes to purple, and it's a nice purple too. 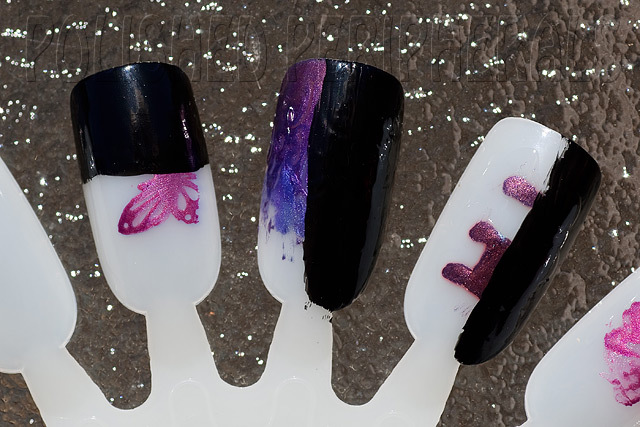 If you're coating your whole nail, or a large part thereof, it can look good, but when it comes to using a topcoat to create nail art it's a bit of a fail. Sure it works, the colour changes, but it's patchy depending on the thickness of the top coat. When coating your whole nail it's easy to get an even coat of topcoat but when you're trying to paint lines, or even just dots, then the colour change will be less along the edges of your art, making it look like the work of an unsteady hand. I bought these thinking I could stamp over them in clear but it doesn't work. 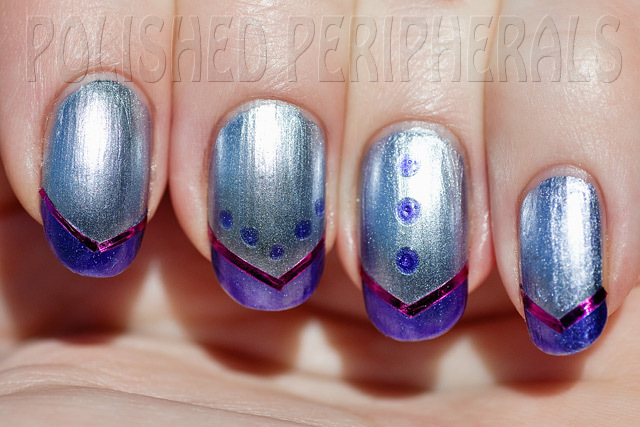 Stamped polish is too thin to have an effect. Turns out it's not just clear polish that makes the colour change. Paint it on a clear swatch stick then have a look at the back of the stick and you'll see the changed colour there while the front is still silver. Any polish over the top will change the colour but obviously it needs to be sheer or clear based to show the effect. Glitter or holo topcoats can look pretty, especially on the tips and sheer red or blue polish will give you different shades of purple. After experimenting for a while on a nail wheel I decided to try some sort of a french tip with this. I freehanded the tips with topcoat, two coats to try and get an even colour change and then because the effect was thinner at the edges I used striping tape to the cover edges. A few dots with a dotting tool finished the design. Then I was stumped, I'd normally use a topcoat over striping tape to seal it but that would have changed all the colour to purple. I very carefully painted the topcoat over just the edge of the tape on the purple side but it wasn't enough to smooth and seal the tape. So are these worth it? We'll I'm glad I have them, they are fantastic as single coat polishes and I quite like the finish and the colours but it bugs me that I can't wear them with a topcoat, unless I want the colour to change. A single coat of polish and no topcoat feels unfinished to me. They stamp well but then the edges start to bleed, like the change colour is leeching out. For single coats and stamping the regular Barry M foil effects (gold, silver and lilac) work just as well without the leeching and topcoat restrictions. I like the novelty factor of the Chameleon polishes but as a form of nail art these may not be worth the effort. I think I need to experiment until I find a way to use these better. Really it's no different to painting nail art with a coloured polish, except that with clear it's harder to see what you're doing, it's a patchy result and you can't finish with a top coat. Sticking on any details like nail gems with clear polish or glue is out too, because any messy application would change the colour. I suppose it makes for a quick change, you could wear it one day as the base colour and the next day just add top coat for a different colour. It's interesting to note that what ever causes the colour change continues to 'leech' through any layers or topcoats. After playing with these on a nail wheel I painted over them with a thick opaque white polish so I could use the wheel again. The white polish turned a tinted pink or purple (depending on which Chameleon polish it was over) except for a strip on each 'nail' where I'd left some clear tape over the Chameleon polish, the white stayed white on the tape. I did 3 coats of the white and then tried a few different colours layered over, red, black, blue, I couldn't see any difference in the black but the red and blue looked darker where the Chameleon polish was not covered by tape. I followed with another opaque white and the colour still leeched through with the final coat being tinted the Chameleon colour. The colour got stronger over time. So weird seeing a thick white polish, over black, turn pink. So the topcoat doesn't change the colour of the base polish, it's the Chameleon polish that changes the colour of the topcoat, or any other polish on top. Interesting, not that I think this has any use for nail art but it does make me wonder what chemicals are at work to keep changing the colour of all those polishes. I did a bit of a quick experiment so I could photograph this effect. On three separate 'nails' on a wheel I stamped with Chameleon Pink, did a rough drag mixed gradient with Chameleon Lilac and Chameleon Blue, and painted the word HI with a dotting tool in Chameleon Blue. Then I topcoated each. 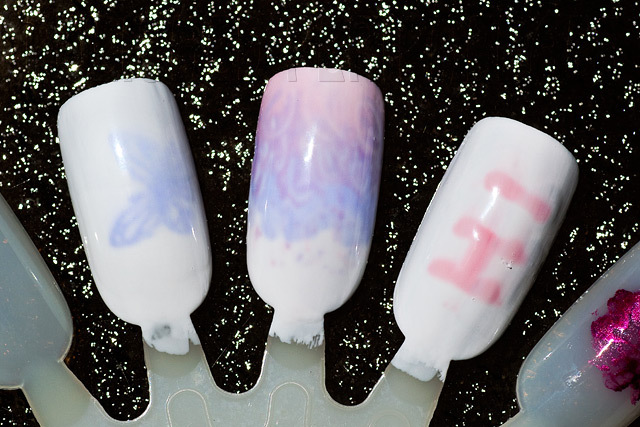 The stamped butterfly didn't change much, the topcoat wasn't thick enough there but you can see the purple colour leeching around the edges, that's the change colour for the pink. The lilac and blue 'gradient' had a thicker coat of topcoat so they changed more but most of the change was between the two colours where they mixed and changed each other. The blue in HI changed to burgundy with a thick topcoat. You can see the red colour leeching there too. Then in the next photo I painted over half of each design with black. Ulta3 Black Satin PRC, my favourite single coat black. I left that to dry thoroughly before coating each in three coats of thick white polish, Ulta3 Lily White PRC, my favourite single coat white. I allowed each layer to dry completely. You can clearly see how the change colour of the Chameleon polishes are leeching through all the layers, including the black. The colours have changed fully with the thick coating too, finally the butterfly is purple. The white has covered the black but it can't stop the Chameleon polish. It's a chemical reaction that has me intrigued. I wonder if there's any practical use for these? How about hiding secret messages under black polish that can be revealed with a coat of white? My kids might like the idea :) I purchased these direct from Barry M at www.barrym.com Shipping was quick and everything arrived well packaged. Now that my head had returned to it's normal size after that ego boosting first paragraph, left me say WOW, what amazing and in depth post. I'm so fascinated by how the colour leached through the black. I actually really love the effect of the chameleon polish beneath the white, its so subtle and ghost like. 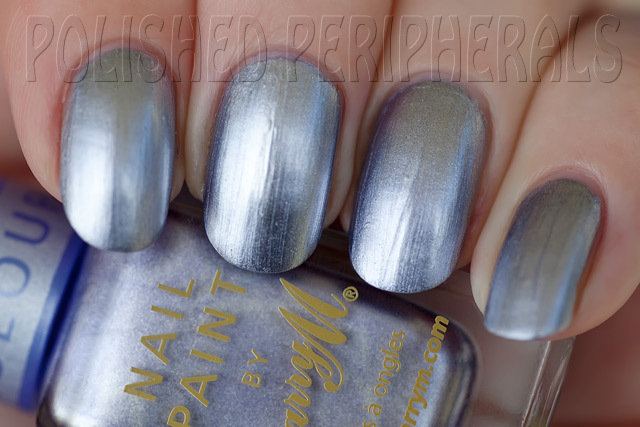 I think I'm going to have to try at least one of these Barry M polishes. Thanks so much for guest posting Bec, and don't forget to show Bec's blog some love too, at Polished Peripherals. What a great detailed posting! Thanks for allowing us to follow in your curiousity. What interesting polish. Thank you for such in-depth results. 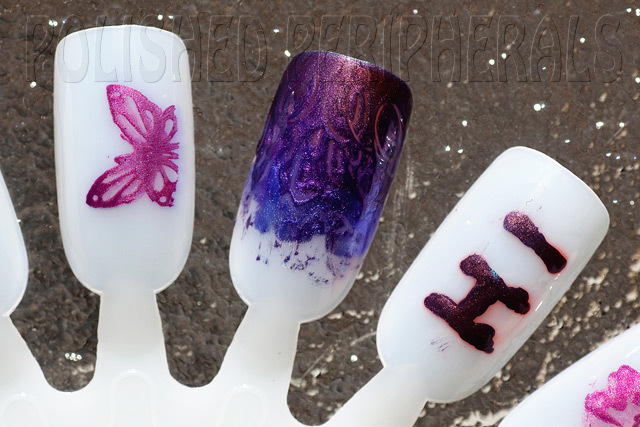 very interesting polishes.. but I just love how Chameleon Lilac looks just as it is! gorgeous! How interesting! I have one of these polishes untried in my stash but I can see I'm going to have to pull it out!